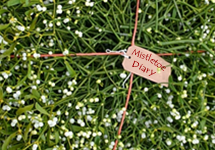 A long time since my last posting – but I’ve been rather busy working on a non-mistletoe project, a book on canal natural history that the publishers want this spring. For TEME there was a considerable grow-kit order backlog from Christmas – and so Caroline and I have found ourselves helping create bulk quantities of the grow-kits – several hundred at once on occasion. I would have put a pic of this exercise here – but can’t find the right CF card.